Mars was known as the "fire star" to ancient Chinese astronomers, and scientists are still burning with questions regarding the Red Planet. Even after dozens of spacecraft have been sent to Mars, much remains unknown about that world. Here are some of the biggest unsolved mysteries we have about Mars as NASA prepares to launch its latest Martian probe, the huge Mars Science Laboratory Curiosity, on Nov. 25. 1. Why does Mars have two faces? Scientists have been puzzling over the differences between the two sides of Mars for decades. The northern hemisphere of the planet is smooth and low — it is among the flattest, smoothest places in the solar system, potentially created by water that once flowed across the Martian surface. 2. What is the source of methane on Mars? Europe’s Mars Express is circling the red planet, geared to detect gases within the martian atmosphere. Methane — the simplest organic molecule — was first discovered in the Martian atmosphere by the European Space Agency's Mars Express spacecraftin 2003. On Earth, much of the atmospheric methane is produced by life, such as cattle digesting food. Methane is suspected to be stable in the Martian atmosphere for only about 300 years, so whatever is generating this gas did so recently. Still, there are ways to produce methane without life, such as volcanic activity. ESA's ExoMars spacecraft planned for launch in 2016 will study the chemical composition of Mars' atmosphereto learn more about this methane. 3. Were there oceans on Mars? 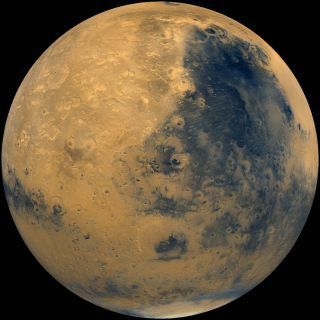 Numerous missions to Mars have revealed a host of features on the Red Planet that suggest it was once warm enough for liquid water to run across its surface. These features include what appear to be vast oceans, valley networks, river deltas and minerals that required water to form. However, current models of early Mars' climate cannot explain how such warm temperatures could have existed, as the sun was much weaker back then, leading some to ask whether these features might have been created by winds or other mechanisms. Still, there is evidence suggesting that ancient Mars was warm enough to support liquid water in at least one site on its surface. Other findings hint that ancient Mars was once cold and wet, not cold and dry nor warm and wet, as is often argued. 4. Does liquid water run on the surface of Mars now? Although large amounts of evidence suggest that liquid water once ran on the surface of Mars, it remains an open question as to whether or not it occasionally flows on the face of the Red Planet now. The planet's atmospheric pressure is too low, at about 1/100th of Earth's, for liquid water to last on the surface. However, dark, narrow lines seen on Martian slopes hint that saltwater could be running down them every spring. 5. Is there life on Mars? The first spacecraft to successfully land on Mars, NASA's Viking 1, began a mystery that remains tantalizingly unsolved: Is there evidence of life on Mars? Viking represented the first and so far only attempt to search for life on Mars, and its findings are hotly debated today. Viking had detected organic molecules such as methyl chloride and dichloromethane. However, these compounds were dismissed as terrestrial contamination — namely, cleaning fluids used to prepare the spacecraft when it was still on Earth. The surface of Mars is very hostile to life as we know it, in terms of cold, radiation, hyper-aridity and other factors. Still, there are numerous examples of life surviving in extreme environments on Earth, such as the cold, dry soils of the Antarctic Dry Valleys and the hyper-arid Atacama Desert in Chile. There is life virtually wherever there is liquid water on Earth, and the possibility that there were once oceans on Mars leads many to wonder if life ever evolved on Mars and, if so, whether it might be extant. Answering these questions might help shed light on how common life may or may not be in the rest of the universe. 6. Did life on Earth begin on Mars? Meteorites discovered in Antarctica that came from Mars — blasted off the Red Planet by cosmic impacts — have structures that resemble ones made by microbes on Earth. Although much research since then suggests chemical rather than biological explanations for these structures, the debate continues. These findings do raise the tantalizing possibility that life on Earth actually originated on Mars long ago, carried here on meteorites. 7. Can humans live on Mars? The six volunteers of Russia's Mars500 mock Mars mission pose for a crew portrait in May 2011 during their 520-day endurance mission simulation. To answer whether or not life did or does exist on Mars, people might actually have to go there and find out. NASA's plan as of 1969 was to have a human Mars mission by 1981 and a permanent Mars base in 1988. However, interplanetary human voyages pose definite scientific and technological challenges. One would have to deal with the rigors of travel — issues of food, water and oxygen, the deleterious effects of microgravity, potential hazards such as fire and radiation and the fact that any such astronauts would be millions of miles away from help and confined together for years at a time. Landing, working, living on another planet and returning from it would offer a host of challenges as well. Nevertheless, astronauts seem eager to find out. For example, this year six volunteers lived in a pretend spacecraft for nearly a year and a half in the so-called Mars500 project,the longest spaceflight simulation ever conducted, aimed at replicating a manned mission to Mars from beginning to end. There are even numerous volunteers for a one-way trip to the Red Planet. Tiny rock-eating microbes could mine precious extraterrestrial resources from Mars and pave the way for the first human colonists, and farmers could grow crops on its surface. The mystery as to whether or not humans will ever go to Mars may rest largely on whether or not the powers-that-be can be convinced to go there.